69. 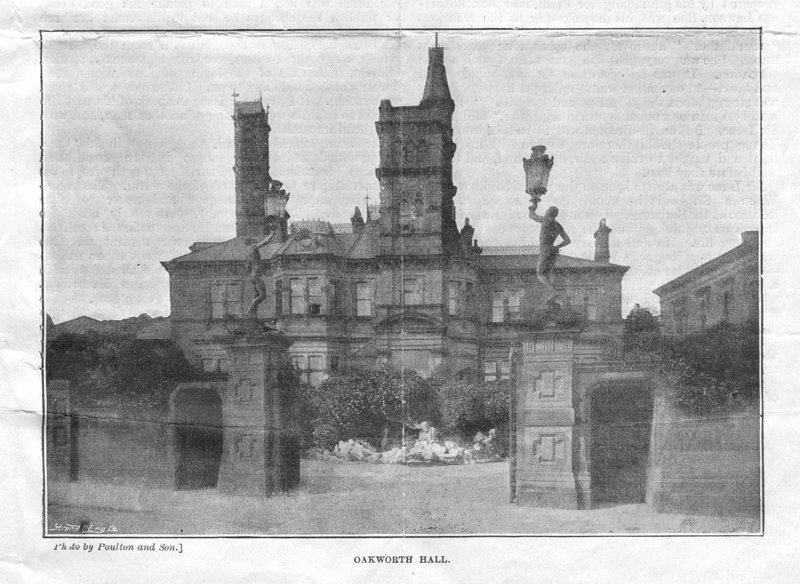 “A STATELY MANSION, substantially built of STONE, in a pleasing style of ARCHITECTURE”: auction plan and description of Sir Isaac Holden’s Oakworth House. “An elegant edifice … most elaborate and sumptuous” Keighley Past and Present (1879, p.236). 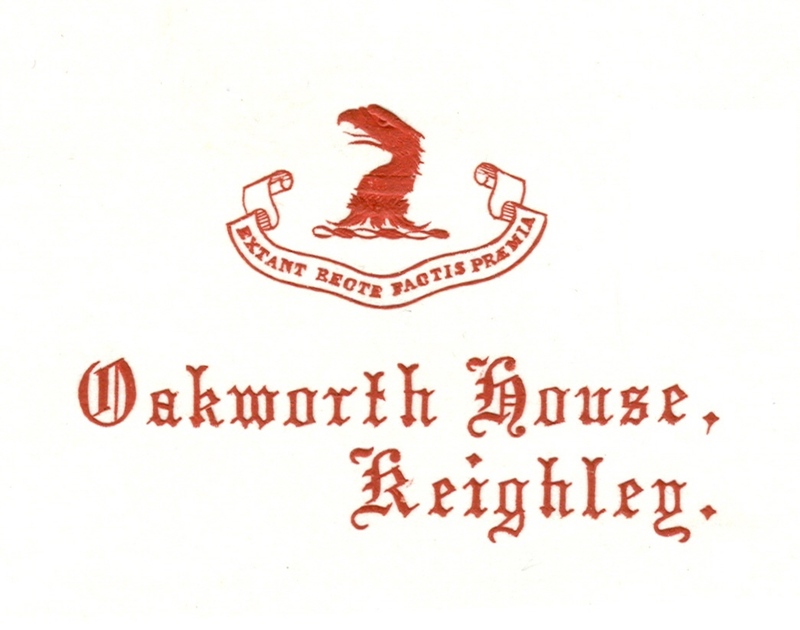 This week, documents which give a vivid picture of a lost wonder of Bradford: a plan and draft description of the Oakworth House Estate written for the Sale by Public Auction at the Temperance Hall Keighley on 20 July 1898. Located in the village of Oakworth, just outside Keighley, Oakworth House was a large Italianate villa, designed for Sir Isaac Holden by Bradford architect George Smith. It replaced a smaller house built by Jonas Sugden, brother of Isaac’s wife Sarah. On the edge of the moors, with clean and bracing air, Oakworth village was becoming popular with well-off Bradfordians seeking to live outside the pollution of the city; it was easily commutable from 1867 thanks to Oakworth Station of Railway Children fame – though, typically, Sir Isaac tended to walk to his Alston factory, on Thornton Road, about 9 or 10 miles depending on the route. 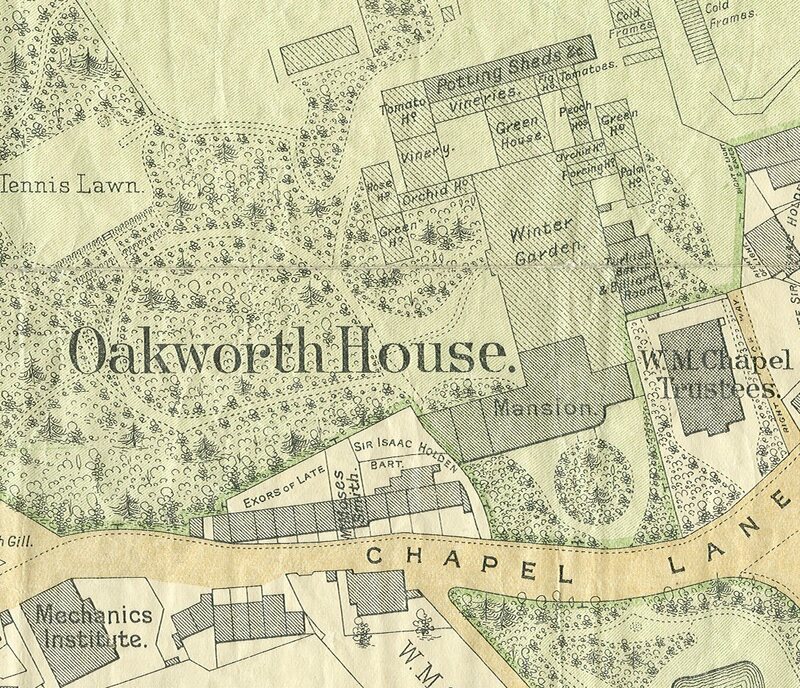 Oakworth House took ten years (1864-1874) to complete and cost £80,000. Sir Isaac took a close personal interest in all aspects of its design, sparing no expense to include every luxury and convenience: electric and gas light, telegraph, telephone and innovative heating and ventilation systems. It had a Central Hall, Drawing Room, Dining Room, Library, Morning Room, Study, Billiard Room, eight bedrooms, two bathrooms, servants’ quarters, offices and cellars: the auctioneer’s description gives dimensions and details of elements such as the splendid oak panelling. Many of the features of Oakworth House reflected Sir Isaac’s beliefs about health: the value of fresh fruit, exercise and very hot daily baths. Hence a Turkish Bath was fitted in the house, while the grounds contained a unique Winter Garden and many other Glass Houses (Peach House, Vineries, Fig House, Tomato Houses …). French and Italian craftsmen created magical caves, grottoes and mosaic paths in the extensive woods. Oakworth House, Keighley, by Poulton and Sons (mislabelled Oakworth Hall, which is an 18th century building still in existence). After Sir Isaac’s death in 1897 (in his 91st year – a lifespan possibly thanks to his healthy lifestyle! ), the House was left empty. Sadly this wonderful building burned down in 1909. 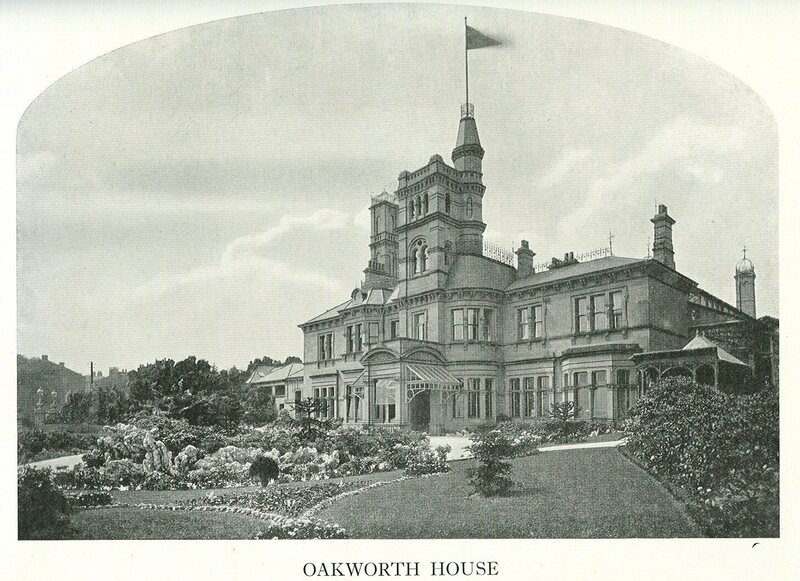 Later his family presented the grounds of Oakworth House to the local Council as a public park in his memory; Holden Park was opened by his grandson Francis Illingworth in 1925. It is still open to the public, who can delight in what remains of Sir Isaac’s magnificent mansion: the portico, summerhouse, caves, grottoes, mosaics, paths. 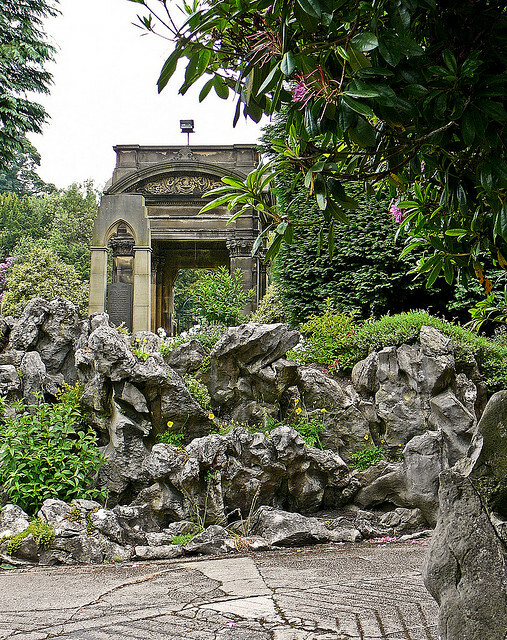 Holden Park in 2009 showing the portico and some of the rockeries. Photo from Tim Green’s flickr stream under CC BY 2.0. Sources: plan and description archive reference HOL 3/2/2. This account is based on many published and unpublished sources, including the Holden Papers and The Holden-Illingworth letters. This entry was posted in Bradford, Wool Trade and tagged Auctions, Bradford, Gardens, Houses, Isaac Holden, Keighley, Oakworth House, Plans, Victorian. Bookmark the permalink. A very enjoyable post. John Bright said of Oakworth House that it was ‘a magnificent place, containing almost all that the heart of man could desire, save a dog’! Really really like this site, excellent local history coverage. Would there be more on Oakworth/Keighley to come? Could we arrange a visit for some of my secondary students to viist the archive and see the blog in action? We are delivering a new course next year including lots of local history in the Industrial Revoltion and we’d like to develop links with you. Would you be interested?